In a continuation of the previous instalment Harry Potter and his friends set off on a quest to locate and destroy Lord Voldemorte's Horcruxes. At the same time they are all intrigued by the Deathly Hallows, a super-brilliant wand, a resurrection stone and a fabulous invisibility cloak. At the same time as trying to maybe find those three things they also need to try not to be caught by Voldemorte's posse... as they've taken over the ministry and Harry is first on Lord Voldemorte's hit list. 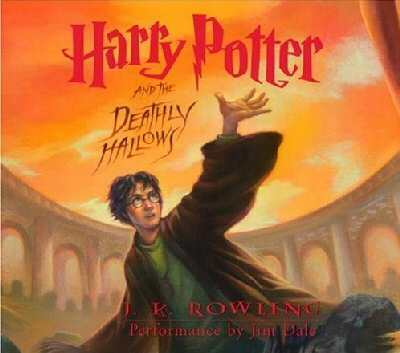 What ensues is a lot of popping in and around dramatic landscapes, arguments, a humungous battle as Harry Potter and friends must defend Hogwarts from the oncoming war. Oh Jim Dale... you served me well. You were really brilliant, and if I ever meet you I will applaud right in front of you... on my own, like a cheesy 80s movie. He was awesome. Very good. As good as man with a deep voice can be. I absolutely loved his narration pretty much all the way through. I made a few comments regarding his lady voices - but well, that can't be helped can it? Wow, what an epic piece of fiction. It was great. I enjoyed it immensely. The writing was fabulous although at times it did feel a little drawn out, but I totally forgave Rowling just because it was so awesome. I am glad it ended as it did. It couldn't have ended any other way (I'm not talking about the epilogue by the way). The story was a true coming of age story with the final battle being that fateful moment where they all had to become adults. I was quite surprised about how the final battle compared with the movie... and even the death of Lord Voldemorte. It seemed like a total anti-climax compared to the epic movie fight scenes. The thing I found hardest and found it a little too much... was the fact that pretty much everybody kinda died. I know there are thoughts a plenty as to why Rowling did this, but I just thought it was just too much. It's like nearly everybody who came from his father's generation i.e. his father's friends all just died. Maybe I'm just a big wimp... but it was overwhelming. My final thoughts on Harry Potter will be coming up soon! Don't hold your breath though, as it won't be coming up in three minutes, you may have to wait a little longer than that!